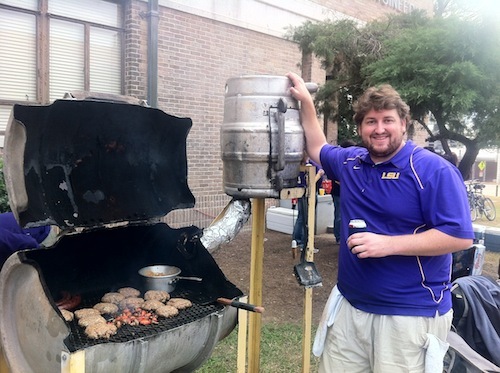 At LSU, tailgating is as important as the Fighting Tigers themselves. Some families hold onto tailgating spots for generations, passing them down from friends and family along with each tailgate’s own rules, traditions, and recipes. The food that LSU Tiger Tailgaters cook up on game day is legendary throughout college football, and it takes excellent chefs with some special equipment to get the unique Louisiana foods that are found around Death Valley. A black cast iron pot is a tailgate stalwart. Craig Messer of the Chest Box Tailgate has used his custom fabricated pot for “several different types of jambalayas, gumbos, and alligator sauce piquant… We have also fried huge batches of freshly caught speckled trout.” Frying may be standard at any college tailgate, but the only place to find hot, fresh cracklins is at LSU. CBT always cooks a few batches in their black pot. This way, the pot is well seasoned for a jambalaya. The pot also serves a secondary function on the grill: as a windshield. The good old barbeque pit is another trusty companion at tailgates, but that doesn’t mean you’ll find just any backyard grill. My tailgate crew made a custom pit out of a full-barrel aluminum keg with a half-barrel stainless steel beer keg as the smoker. 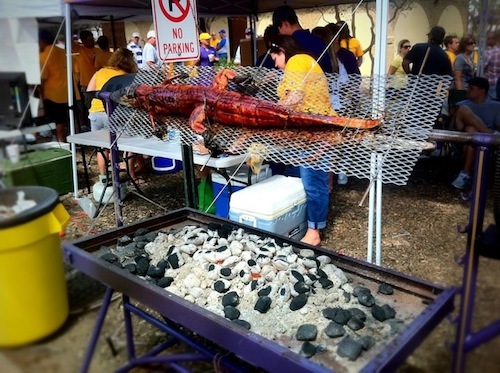 The pit has cooked up some marvelous grub both at home for LSU games as well as on the road — literally. While driving back to Baton Rouge, Louisiana from Little Rock, Arkansas after an LSU-Arkansas tailgate, we loaded the pit (AKA The Monstrosity) up with charcoal and fresh pecan wood, hooked it up to the back of the truck, and smoked our divine swine all the way home. After the seven-hour drive, we had some tender and tasty ribs! It’s hot in Louisiana, but fortunately the majority of football season is in the fall months. For the few Tiger games that are “cold,” tailgaters can usually find a Cajun microwave to stand by and keep warm. For the most part, these “microwaves” are homemade or custom-made, and they’re always a sight to see for the visiting fans. Because the cooking device is large, Cajun Microwaves are generally saved for the biggest games of the season when tailgaters go the whole nine yards. The device works like a large oven where heat is applied from the top down. A fire is built on a metal lid which sits on a box usually made out of wood. As the coals or wood burns, heat is transferred down to the oven below. 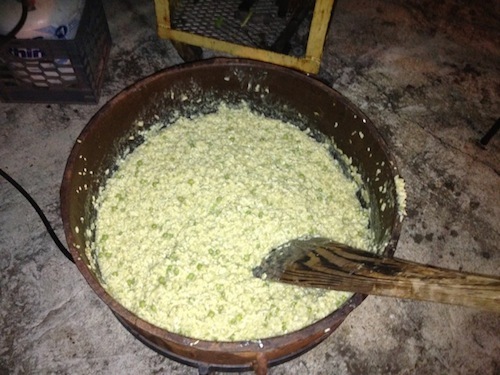 This method of cooking is similar to other cultures that utilize holes in the ground and build fires atop banana leaves. 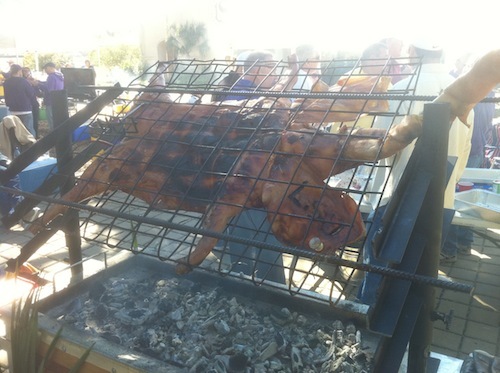 Typically, the roasting boxes are used to cook an entire suckling pig and tailgaters enjoy a cochon de lait. Cajun microwaves can also be used to cook other meats and vegetables. At Chest Box Tailgate there’s always one cochon de lait a year. “I have a Cajun microwave that I use that was built in the 1970s or 80s. It belonged to my dad who used it for their tailgates,” said Eric Eskew. Every now and then you’ll see a whole animal roasting above a Cajun microwave or atop hot coals of its own on a rotisserie spit. It’s an effective taunt to other teams by showing their visiting fans how we Louisianans devour our opponents. No matter what equipment is used, LSU tailgaters know how to feed the masses and have a good time. I’d love to see some cooking contraptions from other parts of the country. What devices do your game-day rituals bring out? Tweet me @biteandbooze or post it on my Facebook page to let me know!